Possible prickly heat rash on arm. 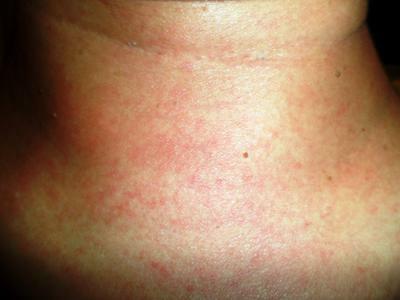 Possible prickly heat rash on neck. I have been having this rash daily for three months now. 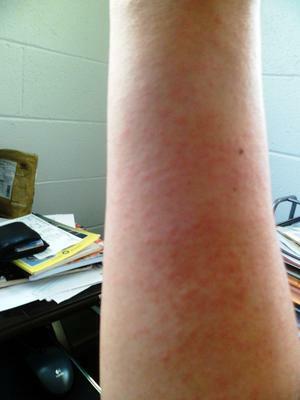 The rash started in mid July when the weather changed to hot and humid. I had a series of allergy skin tests performed and tested positive for 30 different things. The first thing the allergist wanted me to take was Fluconazole because he felt I had systemic candida. I went to get a second and third opinion with a dermatologist and my primary care physician and both of them said I don't have systemic candida. I don't have any rash when I wake up in the morning. The rash seems to come out more as the morning progresses. When I do go into direct sunlight that's when it seems to trigger the rash more. I also have pet birds and I was thinking if I am allergic to them. And yes, feathers was one of the things I tested positive for on the allergy test. My dermatologist seems to think that the skin rash is caused by heat and nothing allergenic. He diagnosed me with Urticaria. I think its more likely prickly heat. The rash comes out mostly during the daytime and can come out wherever I go. When I am around my birds the rash does come out but only in a very mild way. However, the room that the birds are housed in is very hot and humid. Another thing that I think this skin condition could be is a stress rash but getting it daily for three months is that big question mark in trying to diagnose this rash properly. This whole thing is driving me crazy. I don't trust the doctor's diagnosis 100 percent and I really don't know what to do anymore. 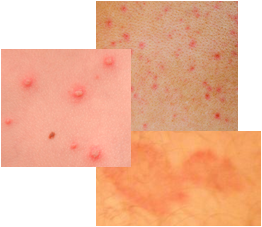 I have provided a couple of pictures of the skin rash.